For students of community health nursing at Hopkins, one lesson emerges time and again: Understanding a patient's home life is crucial to providing effective medical care. 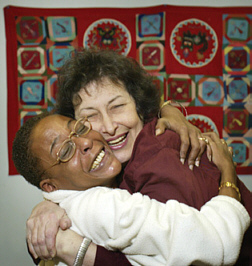 Opening photo: Marion D'Lugoff (r), with patient Benita Montgomery, at the Wald Clinic's Rutland site. It is a quiet afternoon at the Wald Clinic's Rutland site in East Baltimore. On most Tuesdays, when the clinic stays open late, the staff works nonstop. But today, two mothers who had each blocked out time for their entire families have called to cancel. In between attending to those who drop in -- a teacher from the Early Head Start program down the hall who brings a 2-year-old boy for a checkup, a neighborhood woman who needs a follow-up hepatitis B vaccine, another with an infected finger -- the five student nurses on duty busy themselves cleaning donated toys with medicinal wipes and discussing the holiday party they're planning for current and former clinic patients. The clinic is located on the ground floor of the Rutland Center, which provides transitional housing for 37 families who would otherwise be homeless. 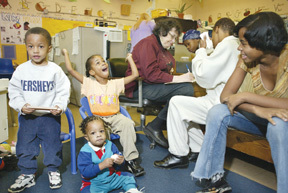 Operated by the Johns Hopkins School of Nursing, the site serves residents of the Rutland Center and its East Baltimore neighborhood. It's a modest place -- a large room divided by panels with a couple of small adjacent offices used for consultations and exams. The building's former life as a public school is evident in the painted cement block walls, scuffed linoleum floors, and rattling institutional file cabinets, which are now painted bright blue. A woman enters with her teen-age daughter. She learned of the clinic, one of the few in the city that will treat patients who have no health insurance, from the Department of Health. The two have taken the bus from a neighborhood several miles from here. The girl needs a physical so she can go out for sports at school. 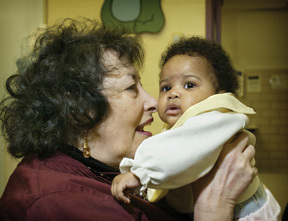 The mother sits down with Linda Whitner, the clinic's community health worker, who immediately begins to help her fill out application forms for the Maryland Children's Health Insurance Program. 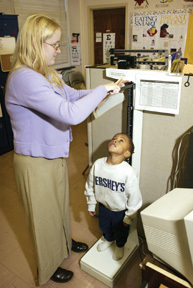 Meanwhile, Cayley Martin, a Hopkins student nurse, takes the daughter, Yvonne*, into a private office to begin a chart. Martin, who grew up in Southern California, has a kind voice and a direct manner. She asks Yvonne about school, boyfriends, how she feels. The 13-year-old slumps in her chair, her hip-hugging jeans stretched tight across her thighs, and answers Martin's questions. She is an OK student. She's studying computer science and wants to join the volleyball team. Her older brother is in prison on gun charges but will be released and will likely return home in a few weeks. Her mother is HIV-positive. Lately, Yvonne has felt tired and doesn't feel like eating in the morning. Her mother asked her if she might be pregnant. "No way," Yvonne says, sitting up. She says she's not like the other girls in her neighborhood, girls barely out of junior high with babies. Besides, her boyfriend loves her. He pays for everything. Marion D'Lugoff, director of the Rutland clinic and an assistant professor at the School of Nursing, has been observing Yvonne's intake interview. She begins to ask questions of her own. What would Yvonne do if she were pregnant? How would she tell her mother? How involved is the boyfriend in her life? Does she think she should have a pregnancy test? Community health students at the School of Nursing log some 12,000 hours annually for the Community Outreach program. Nothing about this situation is new to D'Lugoff, who founded the clinic at the Rutland location in 1992 and named it after Lillian Wald. Wald's work in establishing New York City's Henry Street Settlement in the early 1900s defined the concept of "public health nursing" by exemplifying the connection between living conditions and the health of the poor. D'Lugoff is also the driving force behind the Johns Hopkins Community Health Nursing program. D'Lugoff prefers the word "community," since the term coined by Wald has come to imply the broader concept of public health. Indeed, if public health today is about populations and policy, community health nursing is about individuals. Clients who walk through the door of the Rutland clinic are given exclusive attention for as long as it takes to deal with the problem, whether it's a construction worker's exposure to lead, or patches of eczema on a 3-year-old's tummy. There are no time limits imposed by HMO quotas, and the staff, comprising students and Nursing school faculty, approach each case with close attention and care. At Hopkins, a career in community health nursing can be pursued either as a formal graduate degree in the School of Nursing's master's degree programs (currently about 29 graduate students are enrolled), or through an undergraduate degree emphasis in the school's Community Outreach program. Students who participate in this program are paid a stipend or volunteer to work in the community as they complete their undergraduate BSN degree. The outreach program operates five health centers under the Wald umbrella (see box at left). Nursing students, through their work in such programs, often make home visits, learning quickly that effective health care depends as much on understanding a patient's home life as it does on taking blood pressure readings and prescribing medications. The Wald Clinic at The GATE provides health care, counseling, and referrals as part of an employment training program for men and women who have been homeless and/or unemployed for long periods of time. The Wald Clinic at the House of Ruth, a shelter for women and children who are victims of domestic violence, offers health assessments, health care, and referrals. There is also a Wellness Center with classes in meditation and yoga, massage therapy, and other techniques designed to help with relaxation and recovery from trauma. 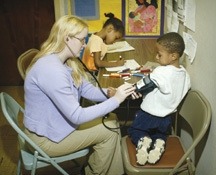 The Wald Clinic at St. Bernardine's School is a health care center for the students of a West Baltimore primary school. As an example, D'Lugoff recalls a mother whose four children had impetigo, large facial sores that threatened to become permanent disfigurations. Three times, the woman had received a prescription for antibiotics from another clinic, but the infection wouldn't quit. When the woman appeared at the Rutland clinic, D'Lugoff sent a nursing student home with her. "The family had one towel," D'Lugoff recalls. "This was a 20-year-old mother, who had her first child at 15. She couldn't figure out how to watch all four children and safely bathe them." The nurse's role was to teach the mother how to organize the bathing routine -- and to provide four new towels, each imprinted with a child's name. The bacterial infection disappeared: "totally gone, never returned," D'Lugoff says. It is clear that D'Lugoff is thrilled to be here this evening, granted the opportunity to guide her student in ensuring that Yvonne doesn't face a future similar to that of the one-towel mother of four. Yvonne agrees to the pregnancy test and is sent off to the tiny bathroom with a plastic cup. Even before Yvonne has agreed to a pregnancy test, D'Lugoff and Martin gently raise the "what ifs": If she is pregnant, how does she envision her future? Will she want to keep the child, and if so, how will she care for it? Will the father be involved? Will Yvonne continue with school? Will there be enough support in the home to care for a baby? And if the test is negative, what will Yvonne do to prevent a future unplanned pregnancy? If she has only one partner, can she communicate with him about birth control? Can she engage his interest, perhaps bring him into the clinic to discuss it? The girl cries out at the thought of adoption and is emphatically opposed to abortion, she says. She also talks enthusiastically about a future working in the aerospace industry. This interchange is also familiar to the nurses, yet D'Lugoff and Martin are clearly keeping Yvonne's particular situation in mind. At one point, D'Lugoff asks directly if Yvonne feels that her mother, weakened by HIV, would be capable of helping with an infant. The 23-year-old Martin, like many who enter nursing, has a strong desire to return something to a world that has so far been kind to her. "I chose Hopkins for a real life experience, compared to California," she says, where "most of my friends drove BMWs in high school." Sure, she's been challenged: There was the heroin addict living in a condemned house, whose high doses of methadone prevented her from caring for her eight children. D'Lugoff, overhearing Martin's story, interrupts: "Don't focus on the bad things," she admonishes. "For every failure there are hundreds of success stories." Martin quickly shifts to the story of a 36-year-old woman who was severely obese and suffered from hypertension and heart disease. After a brush with death (Martin found her in her apartment with a dangerously low pulse-oxygen level and got her to the hospital before she died from respiratory arrest), the patient has lost weight, is working toward her GED, and has a part-time job. D'Lugoff is fiercely protective of the people she serves. Ever since the 1960s, when she was a nursing student in New York City, she has retained her view of the poor as struggling heroes. "Poverty is not about anything but not having money," she insists. "It has nothing to do with your personality or your mores. There is no such thing as the 'culture of poverty.'" She singles out Linda Whitner, who is chatting with Yvonne's mother, both women still unaware of the drama unfolding in the exam room. Whitner came to the Rutland Center in 1995, a recovering cocaine addict with two children. She entered a work training program jointly operated by the shelter and the Wald Clinic. She is now a full-time employee, answering phones, maintaining the appointment log, and working with patients to fill out various forms. She is also good at making friends at other agencies, enabling her to negotiate beds in treatment centers, donations for services at Planned Parenthood, or a spot for a toddler in a Head Start program. And she frequently points people in the direction of local soup kitchens. But mostly, D'Lugoff says, Whitner is living proof that things can change. Whitner is aware of the value of being a role model. "A lot of clients distrust the system," she says. "We want them to return, so we have to build their trust and confidence." Yvonne has returned and the door is discreetly closed. After a few minutes, Martin appears from behind the screen, where she has been waiting to see if a line appears on the pregnancy test stick, and sits down. The test is positive. Yvonne clutches her stomach. She is amazed: Though she has never used birth control, she thought that if, you know, he stopped before ... that this couldn't happen. It is clear that Yvonne's mind is catapulting between fantasies: one, the boyfriend who loves her and the opportunity to leave her mother's watchful orbit, and two, her own ambitions to play volleyball, to program computers for NASA. She wants to call her boyfriend right now. D'Lugoff cautions her: "You've got to take care of you first." At the Rutland clinic, there are no HMO-imposed time limits. Clients receive exclusive attention for as long as it takes to deal with the problem. Whether or not a girl turns out to be pregnant, and regardless of her decision, D'Lugoff routinely uses this time to bolster the patient's confidence. "It's important for them to know that they are in control," she says. "They must realize that they have options." At this stage, the decision a young woman makes is not necessarily firm. She may have doubts or change her mind completely. And D'Lugoff wants each one to know that is her right. While the word "abortion" is carefully avoided all evening, the option of "terminating" the pregnancy is raised. Yvonne does not want a little baby taken out of her and thrown in the trash. Martin describes the pregnancy at this stage as blood and tissue. Yvonne seems satisfied with the explanation and it is clear that the nurses are somewhat relieved. As D'Lugoff later says: "No matter what her decision, that little girl is going to need her mommy. And her mommy is sick, so she might not be around to care for a baby." Now there are more questions: How will Yvonne tell her mother, D'Lugoff wants to know. The girl looks terrified. She has fought for her mother's trust and envisions the punishment that will ensue. "You want to know punishment, have a baby at 13," D'Lugoff tells her. Each year, between 40 to 50 School of Nursing students, having completed a one-credit course in community health, are paid by the university to log some 12,000 total hours for the Community Outreach program. Lori Edwards, who coordinates the program, said that although no formal data are available, "a significant number" of these students pursue community health nursing once they have graduated. Edwards also oversees the School's Peace Corps Fellowship grants, through which returning volunteers pursue nursing degrees while participating in community outreach (see Think Globally, Act Locally sidebar). Lori Edwards (r), with community member Callie Brown. Edwards sees these efforts as a crucial part of the nursing profession. "You can't get people to health services until their basic needs are met. That may involve getting their gas and electric bill paid," she says. Martha Hill, dean of the School of Nursing, agrees: "Patients live in a community and return to their community. Understanding what happens there is important." Hill, who received her nursing degree at Johns Hopkins in the 1960s and returned to earn a PhD from the School of Hygiene and Public Health in 1984, points to "the paradox of being the number one school of public health and the number two medical school sitting in the middle of one of the sickest communities in the United States." The School of Nursing, she notes, "has had a commitment to the community since its inception." Hill co-chaired Hopkins' Urban Health Initiative, the committee that designed the Urban Health Institute, established in 2000 to figure out how Hopkins could use its vast resources in health care, and in other areas such as science and the arts, to increase its efforts to help the community around Hopkins' East Baltimore campus. Tom O'Toole, who served as interim director of the institute, described delivering good health as "looking at it in the terms people are living in, rather than waiting until they get sick." The community initiatives run by the School of Nursing, he says, "embody that principle, and that is why we are making a difference in East Baltimore." The Hopkins Bloomberg School of Public Health and the School of Medicine are looking to Nursing as a model for getting students involved in community outreach efforts. "You can't learn everything from journals," points out Paula Williamson, community outreach coordinator for the Bloomberg School. The structure of the Nursing program, she says, "is a good starting point. They've been doing it successfully for years." Jean Ogborn, who coordinates a course on "Physician in Society" for first-year medical students, worries that today's fledgling physicians need more exposure to their patients' living conditions in order to find the balance between "empathetic care and technical care." She says, "Nurses have long recognized the value of family and the community as a force impacting health. Physicians have at times forgotten." Marion D'Lugoff had spent more than 25 years working in underserved communities before coming to the School of Nursing in 1991 to take over the Community Outreach program. She worked at the Gouveneur Health Services Program in New York's Lower East Side, Lillian Wald's territory. She also worked for that city's Mobilization for Youth program. "I came here with an idea of what I wanted to do," D'Lugoff says. She was determined to immerse nursing students in the city itself. Her first project was to bring students to the Rutland Center for hands-on experience with families. This effort grew to become the Wald Clinic, whose Rutland site now sees some 1,200 patients each year. Currently, the clinic is funded by a combination of sources: the School of Nursing, private donations, and grants -- like the one D'Lugoff secured from the Hasbro Foundation for physicals and immunizations for children under 12. There are in-kind donations nearly impossible to quantify, such as the vaccines and medications provided by the Baltimore City Health Department. None of the clinics is charged rent, and the School of Nursing, in addition to filling in the gap when there is a monetary shortfall, contributes staff time -- both that of the nursing students as well as D'Lugoff and Carol Long, a clinical instructor at the School of Nursing. In D'Lugoff's opinion, the clinic is an ideal setting for students to learn that each patient is an individual, not simply a particular ailment or disease. "In the hospital, it's a gunshot wound in the third bed. Here, it's a human being." And she has no trouble crossing the divide to offer personal insight to patients who seek it. In D'Lugoff's opinion, the clinic is an ideal setting for students to learn that each patient is an individual. "In the hospital, it's a gunshot wound in the third bed," she says. "Here, it's a human being." Sitting in a closed-door office, this time with Yvonne's mother, June, whose face went through an animated contortion of shock when she learned of her daughter's condition, D'Lugoff says, "I have a teen-age daughter and I can tell you, I understand how you feel: shocked, angry, frightened, confused." D'Lugoff continues: "My child is bright and funny and nurturing, but she's a child. She has her whole life ahead of her." June has already talked about her religion and certain family members who would judge her harshly for both allowing her child to become pregnant and supporting the termination. D'Lugoff describes Yvonne's options, reviewing with June what she has gone over with her daughter: adoption, abortion, keeping the child and all of its implications. By the time Yvonne and her mother depart, more than two hours after they have first walked through the door, they have ventured into new and unexpected terrain. June has taken her daughter into her arms, and has vowed to be patient with her. Before leaving, June tearfully embraces Whitner, Martin, and D'Lugoff, who pause to return the hugs before putting on their coats to go home. Martha Thomas is a freelance writer who lives and works in Baltimore.